Founded in 1861, SEHBC is a boat club for members of St. Edmund Hall, University of Oxford. We boast a strong membership of approximately 60 students per academic year undertaking undergraduate and postgraduate courses at Oxford University. Rowing for 150 years, St. Edmund Hall men and women have taken the Headship title no less than nine times. Competing to a high standard, the boat club has become an integral part of college life for generations of students passing through this extraordinary academic institution. An exciting day of racing for the Hall, finishing with some of the most interesting coxing seen in quite some time! M3 began their bid for fixed divisions starting 3rd in division six. After clipping the bank, they attempted an over bump on St. Hugh’s M2, hunting them down along Greenbanks and Boat House Island reducing a 4.5 length gap to less than a length - a certain bump tomorrow, giving an excellent opportunity for promotion to division five later in the week! M2 had an equally strong race, starting on bungline 8 in division four, they chased down Trinity M2 and powered through the gut to force an early concession. Tomorrow they chase Balliol M2 who were bumped twice today - M2 are looking forward to their 11th consecutive day of bumping! W1 were unfortunate to have LMH W1 chasing them - arguably the fastest boat on the river. With this Torpids being the first bumps campaign for many of the crew, they showed excellent resilience holding off a solid Trinity W1 and very fast Somerville W1 for a long stretch of the river before being bumped again. Tomorrow they’ll be rallying themselves for a strong row over to put them in contention for bumping back later in the week! M1 were back with a vengeance after the Beast from the East prevented them from blades last Torpids and controversy with Magdalen M1 last Summer Eights. Today they rectified both those grievances by bumping Magdalen M1 again with a row past in the Gut. Unfortunately for them, Magdalen steered into the trees as they conceded and were bumped out of the top division. Tomorrow, M1 will be chasing Jesus or looking for a fast over bump on a poor looking Hertford. Another exhilarating day of racing was kicked off with M3 gaining an over bump on St. Antony’s M2, catching them cleanly before the gut! Tomorrow they move to bungline 2 with hopes of bumping a poor looking Corpus M2 to earn a chance at bumping into division 5 as the sandwich boat. M2 had an equally quick race, gaining an early concession from Balliol M2 by Donnington Bridge. To add to this, Balliol then bumped New immediately outside the Teddy Hall boat house - meaning that M2 go up 2 spaces! Tomorrow they’ll be chasing Catz M2, with the aim of getting a double bump from a weak looking Keble M2. W1 had another unfortunate day, with a small crab turning them into the bank which lead to them being bumped by the sandwich boat. Tomorrow they hope to utilise the clean water at the head of division 3 to earn a solid row over and bump back into division 2! M1 had a significantly cleaner race today, benefitting from the calmed nerves of the day before. Chasing Jesus, they caught them within 30 strokes, forcing a concession before Donny Bridge! They narrowly missed out on a double bump, with Jesus chasing Hertford down to a canvas across the line. They’ll be hoping they can put in an equally strong performance when chasing them tomorrow. Another great day of racing for the Hall! M3 successfully bumped Corpus M2 before gut, and narrowly missed out on bumping up into division 5 due to an equipment failure before the race - hopefully they can hunt down Hertford M2 (who have already dropped a division this week) tomorrow. M2 were unlucky - due to the shared boat with M3, they had to borrow an unfamiliar boat which didn’t help chasing an over bump on a much improved Keble M2. With their normal boat tomorrow, they look to finish the week strong by bumping up to make them the 6th M2 on the river. W1 were caught by quick Worcester and St. Hilda’s crews, but fended off Exeter W1 right the way to the head of the river. Tomorrow they’ll be chased by St Hugh’s W1. M1 “speared the deer” as they caught Hertford M1 just after Donnington Bridge. 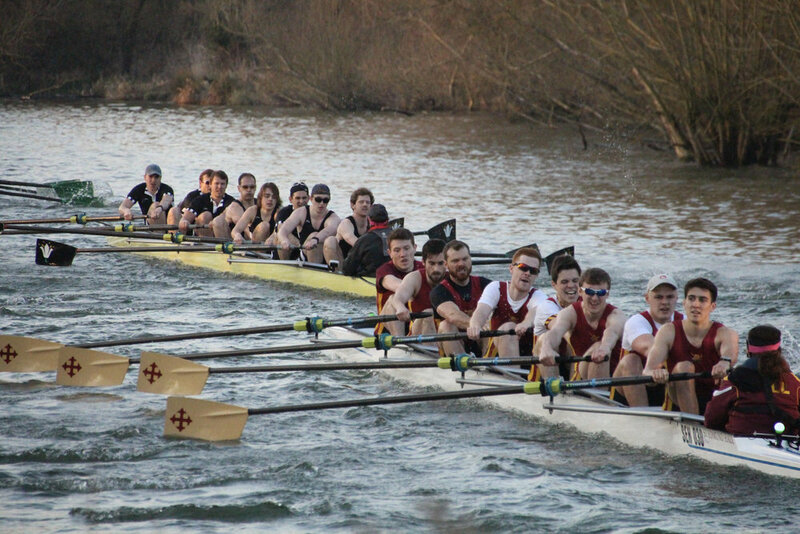 This means that M1 are the only Hall boat still in contention for blades - they are hopeful chasing Balliol M1 who they’ve shared training facilities with at Abingdon for the last two years.